The ceiling is the 5th wall in the room but rarely gets any love except for a coat of generic white paint. But there's plenty of opportunity to punch it up. 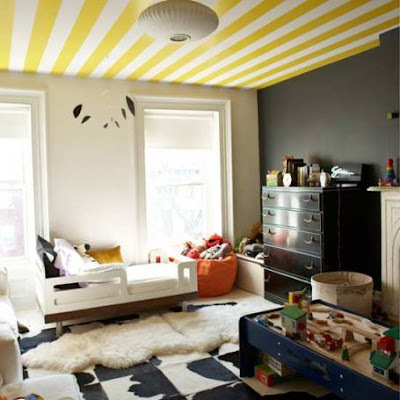 Bright stripes add youthful energy to an otherwise serious kids room. 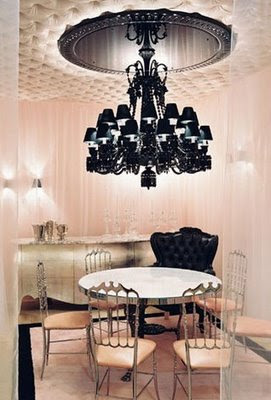 A tufted ceiling makes an over-the-top statement. The black ceiling medallion and chandelier create sophisticated drama. A crossword mural adds whimsy to a traditional family room. 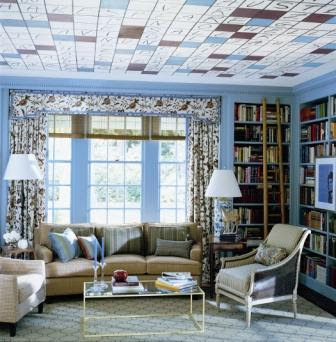 Cover the ceiling and box the room in pattern.